COMPETITION: ABS10 Blacklight Bouldering - NEW!! FREE! Wellness Night - NEW!! FREE! 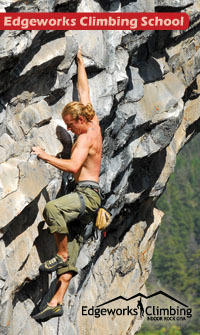 CLINIC: Climbing Knots - NEW!! YOGA: Friday/Saturday Classes Return - NEW!! High School Nights - NEW!! Junior Program For 3-6 Years - NEW!! 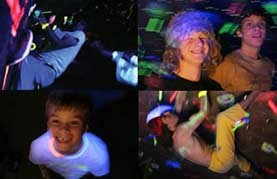 Glow-In-The-Dark, Slacklining, Costumes, Prizes, Body Painting, All-Ages Fun! Click Here! for information and registration! Edgeworks has a a night focused on you and your health! Come for Edgeworks Wellness Night FREE! Join our Community Yoga Class for FREE! Beginners are encouraged to drop in! Convergent Therapies, from Gig Harbor, will be at Edgeworks providing FREE! chair massages and FREE! information about alternative therapies for well-being. Chair Massages and Alternative Therapy Info - FREE! Yoga for the community, all abilities welcome - FREE! Ever wondered how to anchor yourself with a Clove Hitch? How about a using a Munter Hitch if you dropped your belay device? 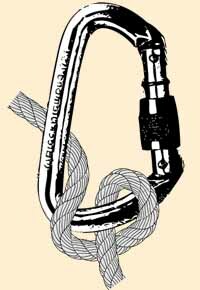 Many knots that are important to climbing will make you a better/safer climber, if you know them. These knots will help you create slings, attach you to anchors, climb up and down ropes and safely substitute knots for gear. 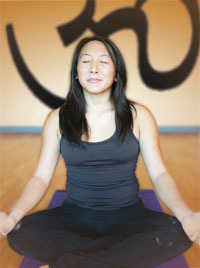 Edgeworks Yoga balances your mind and body by focusing on core strength, endurance, breathing and inner peace. Through our classes your whole body will find balance and stillness while moving between poses that will explore the limits of your body's focus and endurance. Edgeworks yoga is open to all abilities and is popular with both climbers looking to improve their core strength and endurance as well as experienced yogis looking for fun and challenging classes and instructors. Edgeworks members receive discounts on all classes! Edgeworks annual members receive FREE YOGA! Edgeworks supports the local youth through monthly High School Nights! Get in at a REDUCED RATE, rentals are FREE! and get a FREE! 101: Knots and Belaying class. * Student Gear Rentals - FREE!! 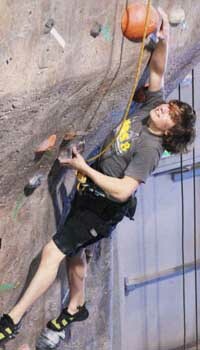 * 101: Knots and Belaying class - FREE!! Edgeworks is seeking High School Reps Now! Check out our Jobs Page! Hole in your sole? Need your rock shoes repaired? Cascade Cobbler and Edgeworks Climbing now offers drop off repair service for your climbing shoes! 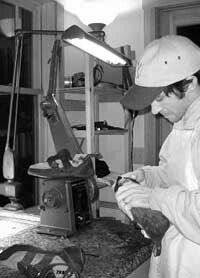 Leave your shoes with Edgeworks, with payment and a completed order form and Cascade Cobbler will repair them for you! On the 2nd and 4th Wednesdays of each month, shoes will be shipped, repaired and returned within a week and a half!. Cascade Cobbler James at work. 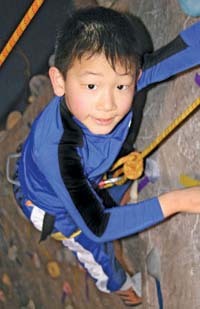 An ongoing, quality climbing experience for climbers ages 3-6 years old. The Junior Climbing Program 3-6 offers an active curriculum taught by our professional, experienced staff in a safe indoor setting with high instructor to climber ratios. Our Junior Climbing Program builds a foundation for strong, fit, motivated, goal oriented kids and the climbing is just plain fun! * We strongly encourage parent participation with the Junior Climbing Program 3-6! * 101: Knots and Belaying is offered FREE!! to participating parents. our annual Blacklight Bouldering Comp! Yay! For our full schedule of this month's calendar (click here)! Join Edgeworks for a night focused on you! Come for FREE! Yoga and FREE! Chair Massages. Chair Massages and Therapy Information - FREE!! Yoga for the community, all abilities welcome - FREE!! Edgeworks is happy to announce the return of Friday and Saturday Yoga classes! For information and pricing (click here). Ever wondered how to anchor yourself with a Clove Hitch? How about a using a Munter Hitch if you dropped your belay device? Come learn these and many more essential climbing knots! Seeking a higher education? Let off some steam and join other students for an evening of climbing at a discounted rate. Day passes are $9 with a valid Washington State College ID (24 years and younger only). Second Friday of each month. Fourth Friday of each month.